College of DuPage Nursing student Bertie Schlossberg asks, “Do you or someone you know have a food allergy or intolerance?” If you answered yes, you might want to keep reading. Per the Food and Allergy Research and Education network (FARE), 1 in every 13 children in the USA underage 18 have food allergies. Although less common in adults. Food allergies affect nearly 15 million people a year (healthykids.org). Below I have included some easy recipes …whether you are just starting out on your new diet or you are a seasoned pro you are sure to enjoy these recipes. Leave a comment or share your favorite allergy friendly recipe. Whip for 2-3 minutes until fully combined and smooth. The mixture will be thick. Add 16 ounces of thawed whipped topping, 8 ounces at a time. Continue to whip until fluffy and light. The filling will be divided into thirds to layer the dessert. Remove the wrappers from the peanut butter cups and chop. Roughly chop the peanuts. Divide both into thirds for layering. 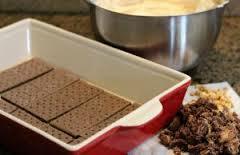 In a 9 x 13 inch dish start with one layer of graham crackers. Add ⅓ of the filling mixture, sprinkle with ⅓ of the chopped peanut butter cups and ⅓ of the chopped peanuts. Gently press the next layer of graham crackers into the filling and repeat, ending with the final ⅓ of the peanut butter filling. Frost with whipped topping, and sprinkle the top with the remaining chopped peanut butter cups and peanuts. Drizzle with chocolate. Transfer back into the pot and add the pasta and broccoli. Season as desired. This sauces freezes so well that you can double the recipe for the dairy free cheese sauce and place half of it into an ice cube tray or a freezer-safe container. Allow to defrost for a quick removal from the container and warm up in a saucepan over medium low heat until heated thoroughly. Gummy Vitamins or Gummy Bears? HPV is more common in men than you think!